Decorative pebbles add fun and colour into a garden. They are great fun to create for both adults and children alike. I know if I wanted to I do not need my niece visiting to get the paint pots out to pebble paint, but it is becoming something of a new family tradition started by my sister. 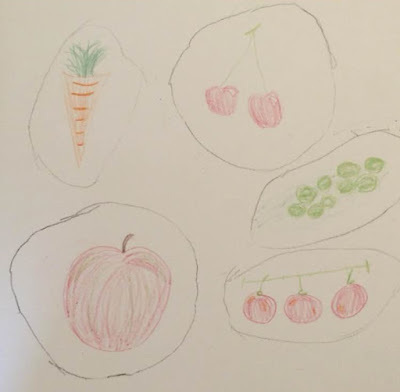 This years Pebble Painting theme: Fruit and Vegetables in the Garden. My niece is a planner, so before she even started painting the pebbles the designs were sketched out on paper. Each of the pebbles depending on their shape were assigned a design and the painting commenced. Sadly there was no painting outside as the weather was awful so we all stayed in the warm and dry. My niece made a fabulous job of creating Garden Fruit and Vegetables Painted Pebbles. They were left to dry, and the following day varnished to protect them from the weather. Neither I or my sister anticipated getting arty, but with the paint pots open and a few plain pebbles crying out for decoration we could not stop myself. I am particularly proud of my Ombre style painted pebbles, and my sister her Aztec inspired dots. All they will now find homes dotted around the garden, and will accompany last years pebbles that were painted with garden bugs. Whilst all this creativity was progressing and waiting for the paint to dry mid design, my niece helped me to capture the fun on video using my phone. If you want to see how the painting progressed watch our fun 10 second animated stop motion Pebble Painting Video. Such a great idea, I am going to give it a try with my Grandson when he visits at the weekend.